An advanced boom design and hydraulic system provide outstanding versatility and high performance in all types of drilling operations. 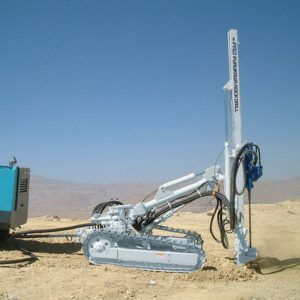 The PCR200 assures outstanding drilling performance – whether it’s road construction, dam work, open area drilling, mining, quarrying operations or tunneling. All are performed with unsurpassed efficiency. The PD200 pneumatic drifter has a large bore (130mm) cylinder, providing a powerful drive for the rapid and reliable hammering action. A dependable and durable geared motor as well as an independent rotation device further ensure outstanding drilling performance. The drifter can withstand severe working conditions, and can also easily handle a wide range of jobs involving various kinds of rock. A variety of bits ranging in size from 64mm to 102mm are available. Total muffler exhaust system enhances operator comfort. Boom offers easy 180-degree power dumping. The guide shell is hydraulically operated within a 180-degree range without inconvenient index pin change. The extra-long 4 ft (1200mm) guide shell slide facilitates drilling and drill-extending operations. Guide shell permits easier drilling with the footpad firmly pressed against the rock even on rough and irregular surfaces. It also ensures safe guide shell retraction with no danger of damage to the guide shell tip. Changeover from vertical drilling to toe-hole drilling can be made easily without changing the pin. The box-type guide shell (patent pending) incorporates a third-stage of the diffusion muffling system for quiet operation. The firmly supported footpad and other design features provide top rigidity for the guide shell. The third muffler is incorporated along almost the entire length of the guide shell to guarantee complete muffling efficiency. The piston-type air motor with an output of 5HP provides an extremely high rod retracting force and ensures rapid operation. This air motor is interchangeable with the power pump motor to reduce your parts stock requirements.